This tool can cut auto windshields, mobile homes, aircraft, trailer roofs, wood, sheet metal, and other building materials. It can also cut and chop ice. This tool features honed 2 angled penetrating points, 10 two sided cross-cutting teeth to cut on both pull and push strokes. Comes with protective plastic point cover. A multi-faceted overhaul tool with unending uses. The C.R.S. tool is the tool used in Desert Storm. The most wanted and useful tool in the Oklahoma City bombing. Use as a shovel, hoe, axe, or piercing tool. "D" handle compliments the unit. Comes in Yellow or Tactical Black. 10 lbs. with Fiberglass or Hickory handles. Also available in our 16 lbs. 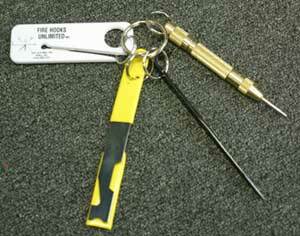 with Fiberglass handle only. The all new, compact, adjustable universal wrench with finger grips and engraved no-slip handle. Will fit pin or rocker lug coupling. No sharp protrusions to cut or tear firefighter pockets. Special alloy super strength. Adjustable, cadium plated celtex grips for safety.